Various business owners have been facing difficulties in choosing the right supplier. Integrating machine learning algorithms with ERP enables the owners to identify which supplier is consistent in delivering products of high quality. It helps them do an in-depth analysis of different processes so that a proper track can be maintained for upkeeping the quality. Every business owner starts up a business with a goal to earn profits. With higher productivity, achieving a goal for an organization becomes easy. There are various methods that can help a business to increase their efficiency and one of them is using AI with ERP tools. With more such Artificial Intelligence solutions, companies can relegate data entry tasks to the software for completion. When an ERP tool is integrated with AI, the scope of committing mistakes gets lesser. With these integrations, employees will be able to prevent themselves from performing a task repetitively. When Artificial Intelligence is incorporated into ERP, it troubleshoots the errors so that measures are taken on time to prevent the system from failure. Running an organization is a tedious task as various processes are going on within it. Big organizations have numerous departments, employees, and operations going on at a time. With so many tasks to perform, it becomes difficult for a human to keep a track of all. Deploying ERP tool with AI can thus help manage business operations and ensure successful completion of tasks. AI keeps a track of processes that are executed and finds out snags if any. With proper tracking through AI, the chances for the occurrence of errors would be less. ERP plays a great role in providing loads and loads of data that can help a business to grow. In spite of the relevant data provided to the companies, it becomes difficult for them to use it for their benefit. Integration of machine learning with ERP enables the organizations to identify the opportunities this data can provide. With such information, it becomes easier for companies to improve their manufacturing, service as well as the sales. 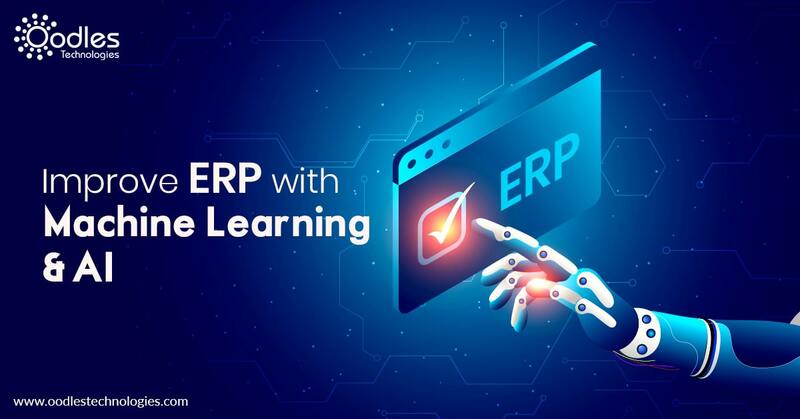 Various experts suggest integrating ERP with machine learning and artificial intelligence as it can help organizations make the best use of the available resources. AI is growing rapidly on a global scale whereas machine learning is getting relevance due to its ability to make the best use of the available data. Both the technologies are at par in making improvements in ERP and helping businesses grow. Are you searching out ways to integrate machine learning in your ERP? Let’s Connect!